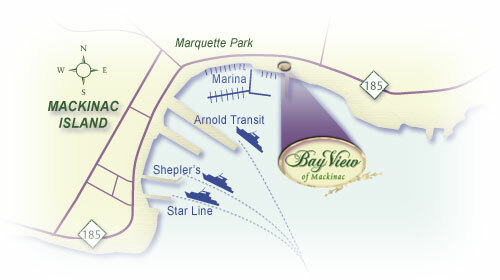 Mackinac Island is easily accessible via highway from Mackinaw City or St. Ignace where scheduled ferry boat service is provided throughout the day and into the evening. As the schedule varies seasonally, please be sure to get current schedule information. Bay View Bed and Breakfast is located just a short 5-10 minute walk from the downtown ferry docks; a leisurely stroll through our quaint downtown shopping area. Feel free to acquire the services of Glenn, our Dock Porter, who can assist in transporting your bags between the ferry dock and Bay View. In addition to ferry service, commercial airline service is available from Detroit and Chicago to Pellston Regional Airport, which is located just 15 miles south of the Mackinaw City ferry docks. Air taxi service is available between Mackinac Island and Pellston as well as bus and taxi service between Pellston and ferry boat docks. The newly renovated Mackinac Island airport has its own 3,500 ft. paved and lighted runway accommodating both private and charter planes. Horse-drawn taxi service is available from the island airport to Bay View.